Drawing on left from Britton, N.L., and A. Brown. 1913. Illustrated flora of the northern states and Canada . Vol. 2: 573. Photo taken in the San Juan Islands by Carson Sprenger, 2006. Elevation in Washington State: 14 - 4500 ft (4 – 1372 m). O. fragilis may not be collected in Washington. Make friends with someone from Nebraska. 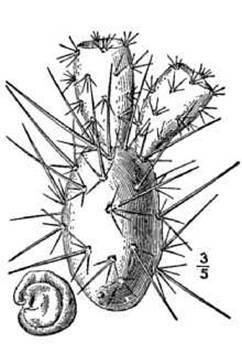 Have that friend send you a vegetative segment (also known as a cladode) of the plant; stick the cut-off portion in well-drained, sandy soil. Water sparingly and be patient. Sandy, well-drained soil is a must. (1) Burke Museum Herbarium Image Collection. (2) PLANT Database. 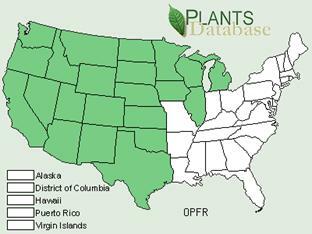 http://plants.usda.gov/java/profile?symbol=OPFR. May 24, 2006. (3) Ribbens, Erc M.D. 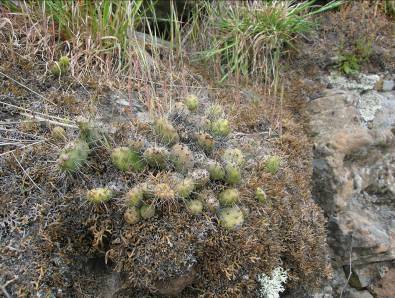 Opuntia fragilis (Nuttall) Haworth (Cactaceae): Reproductive Ecology.